The Seymour 135B camera is a matchbox camera that I made to exactly fit 135-film rolls. Apart from the layout you will need a film cassette, the kind used for loading your own films from bulk rolls, to use as a take up spool. More tips on how to build you own matchbox camera can be found here. 1. Find a box that can be made light tight. This is going to be my camera. A box with a very large hole in the front. This will need to be covered of course. 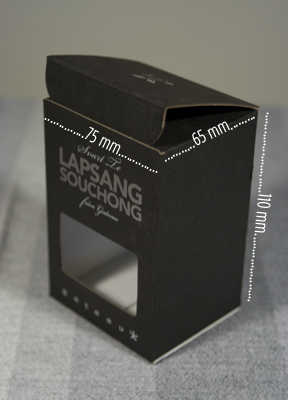 I will place the pinhole itself on the back of the box and the distance between the pinhole and the photographic paper will be 65mm. 2. Cut a piece of metal foil that you can use to make the pinhole. I found an emptied tomato paste tube that I'm going to use. 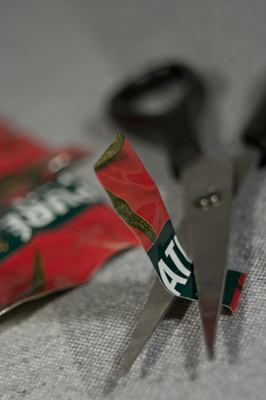 The tube metal is soft enough to be cut with a regular pair of scissors (but maybe you shouldn't use your favourite pair).